I don't have many prime focus attempts under my belt - in fact if you search for "prime focus" on this blog, you'll only come up with 3 posts of the moon at prime focus, and a couple Jupiter, and a couple double stars. 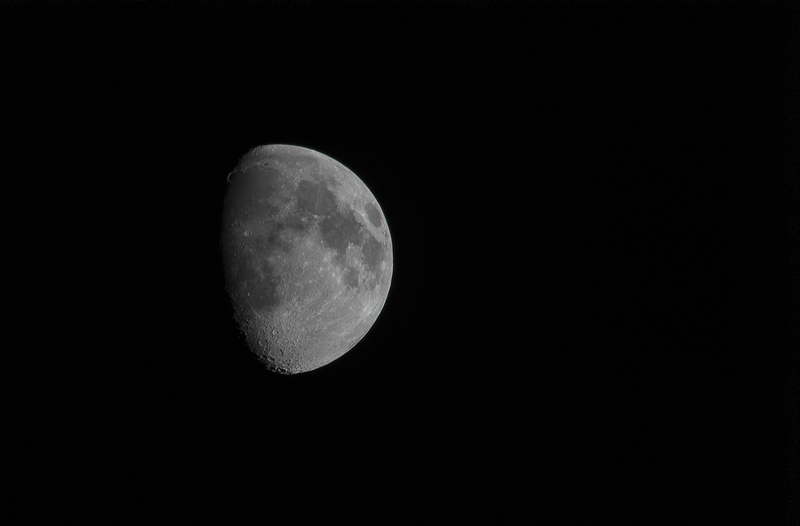 In fact, I don't believe I've even attempted the moon at prime focus since I upgraded from the Canon Rebel XT to the Canon T5i. After some major issues a while back, at least now I have my go-to prime focus attachments using a T-ring --> T-thread to .965" --> .965" threaded collar setup. 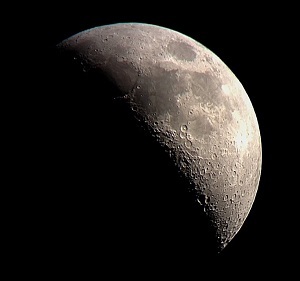 As I've noted before, the hardest part of photographing the moon at prime focus with my Meade 285 refractor is the clunky focusing wheel on the telescope. The focuser is plastic, and there is no fine focus adjustment. So, as you can imagine, when looking at the LCD screen on the back of the camera and adjusting the focus, it's nearly impossible to tell when I'm actually in focus... Whenever I touch the telescope the image jumps all over. With all that in mind, the advantages to prime focus are that you get a much larger image (and therefore higher number of pixels in the diameter of the moon) compared to just a 300mm camera lens. Prime focus definitely has the potential upper hand, but a major handicap when it comes to focusing - whereas the camera lens has incredible hands-free focus, but the moon is only projected onto a tiny area in the center of the image sensor and thus a smaller diameter in real pixels. I took the images below on Sunday, September 11, 2016. 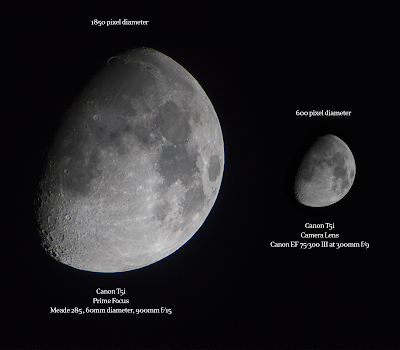 Now many it's not completely fair, the 300mm moon on the right is far from my best attempt. 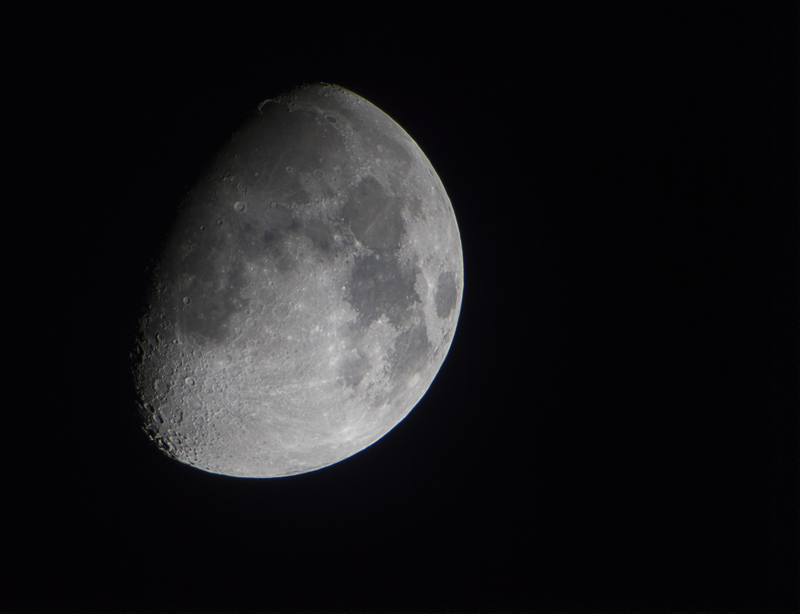 I only stacked 10 frames in Registax, which was having a rough go of it on Windows 10. When I finally got it to stack without crashing, I noticed the alignment wasn't quite right, but it still does a nice job showing the huge difference (3x the diameter) in relative size. During my observing session, I also saw the rings of Saturn through the Meade 285, which is always a treat - even though it is insanely frustrating to try to position this old mount that doesn't want to stay put once you have your target. I also tried several times to get my iPhone mounted on the eyepiece to take a video of Saturn, but the mount is just too finicky and shifty. Finally, I took this quick timelapse video of my prime setup using the app Hyperlapse, which is convenient when you don't know how much you will want to end up speeding up the final video. Unlike the other timelapse apps where you have to set the speed at the beginning.